UK Data Service Team invites all interested parties to try a new ONLINE TEACHING resource which introduces DATA to non-experts via easy-to-use interactive DATA SKILLS MODULES. 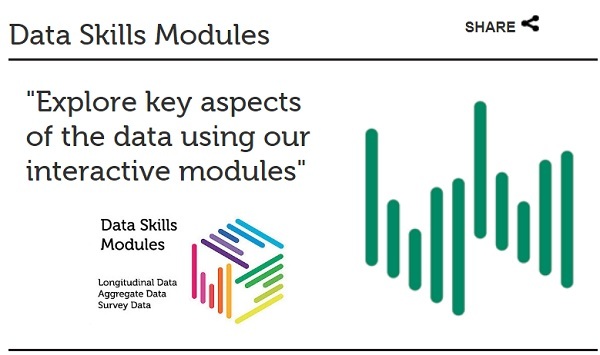 Launched as beta versions, the introductory level Data Skills Modules give those new to research a solid grounding in the key skills needed to make use of our rich data resources. The modules use short INSTRUCTIONAL VIDEOS and interactive quizzes. You can conduct them in your own time, and dip in and out. Glossary of terms used throughout the modules. Each module stands alone but those with little experience of surveys may find it useful to start with the Survey Data Module before moving on to the Longitudinal Data Module. Unit 1: What are survey data? Unit 1: What are longitudinal data? Unit 1: What are aggregate data? Please send UK Data Service your feedback and suggestions. The AIMS Team at FAO of the UN offers a number of other e-learning programs in terms of Capacity Development on Open Data & Research Data Manahement. Later in the year of 2018, some courses will be repeated and we will announce the calls for applications through AIMS web site as well as AGORA website. Please watch these spaces for upcoming events.